Yes, your trusted cleaning service can even clean your roof! Viviane's Cleaning & Restoration Inc provides pressure washing services to clean your driveway, deck, sidewalk or roof. Our power washing technicians have the experience and tools necessary to thoroughly clean all exterior surfaces of your home by applying highly pressured water and just the right amount of cleaning agents to remove dirt, moss, mold and mildew. If your roof is dull or stained with mildew, Viviane's Cleaning & Restoration Inc can provide pressure washing services to thoroughly clean it. Pressure washing can eliminate moss, dust, dirt, leaves and many other types of build up from area rooftops. 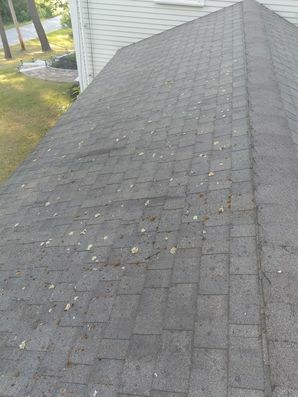 Viviane's Cleaning & Restoration Inc uses a revolutionary cleaning product that has a biodegradable, non-corrosive, non-caustic, non-acidic, eco-friendly chemical to remove algae, mildew, fungus and stains from your roof and exterior surfaces without hurting or damaging your biggest investment. What's more, using our highly effective cleaning products, your landscaping will never be compromised!